The Search is ON for the 2013 SportsKid of the Year! If your child not only LOVES SPORTS but is a GOOD SPORT, then you will want to nominate them for the 2013 SportsKid of the Year award from Sports Illustrated Kids! Sports Illustrated Kids is now taking nominations for the 2013 SportsKid of the Year. SI Kids is looking for kids ages 7 to 15 who demonstrate outstanding sportsmanship through their accomplishments on the field, in their classrooms and in their communities. 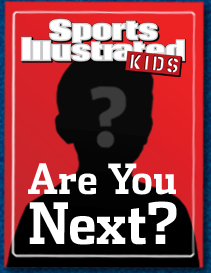 The winner of the 2013 SportsKid of the Year award will appear on the cover of the December 2013 issue of Sports Illustrated Kids! In addition the winner will receive a special SportsKid of the Year jacket and a trip to New York City to accept the award at the Sports Illustrated Sportsman of the Year ceremony! To nominate your favorite kid athlete, please visit http://www.sikids.com/skoty by October 7, 2013! So, hurry over and nominate your favorite child athlete who shows leadership not only on the field or court but in the classroom, home and community! They could become the 2013 SportsKid of the Year! !